This pet is identical to Skywisp Moth, Crimsonwing Moth, and Cerulean Moth. All 4 pets have identical movesets and come in the same 3 breeds with identical stats. The only difference between them is cosmetic. You could have one of each as a different breed, but two will be the same breed. Even the fastest breeds are slow at 289 after the racial passive has worn off. Reckless Strike is nice especially if you can anticipate not getting hit on the next round. 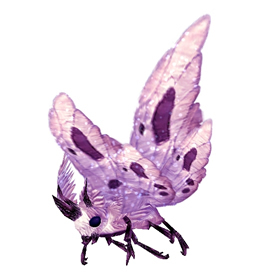 Their wings emit a fine powder as a defensive mechanism when it is in danger.